Happy new year you lovely Positives. Sadly for you our Labo is excused boots today and you have your truly. Not the best start to New Year I know, but here we go. At 3 p.m. we play Fulham at our home stadium, the team we beat/thrashed/took apart 5-1 at the Cottage. That might suggest a comfortable home win when you also consider that they sit 2nd last in the league table on 14 points with a -25 goal difference. A cake walk then? Oh that it was that simple. To be honest, I feel our best chance is if they play badly as our recent form doesn’t suggest we will play well and blow them away. We still have no idea if our best defenders will be fit enough to play and more of a concern to me , we don’t know if our best midfielders will play in midfielders and if our best attackers will play at all. Unbelievable, I’m going to leave it at that. The Ramsey stuff , Ozil stuff, Cahill stuff and so on and so on, has taken the wind from my sails. Everything seems to be going in a direction that I don’t like and I don’t want to drag the rest of you into this dark hole I find myself in. ffs. How is that not a free kick? When do you not see them given when it allows a break at goal? Loud boos directed at Emery from the home fans here as he opts to take off Alexandre Lacazette and introduce Aaron Ramsey. Should help with the old goal difference! Hoping for 5- whip crack a way whip crack a waaayyyy! Just one more month before he signs back up! Fingers crossed the club signs up the player tho improves the club’s scoring ratios every time he’s been on the pitch this season. Objectively. tool of the day on twitter: some scouser-” Arsenal are sh*t just pure luck”. The BBC page on the game is comical about their goal. ‘Lucas Torreira is complaining about a foul, but there was nothing wrong with the challenge. I’ll stand corrected if proper look later reveals their player got nick to it before or at same time as making contact with Guendouzi, but it didn’t even look close with the couple of long distance views I had. Refs almost always play safe there, sensibly ,through a desire not to see a goal conceded from what was or very likely was a foul. Nice to bounce back. Going to take some time to heal a bit. But every win is a step forward. Shame the torture of whose leaving or not is on us again. Even if he is going at least Rambo does his bit. Like I said before the game today is about confirming things we already knew, Aaron is brilliant and will always score important goals and refs against us are poor for some strange reason. At the moment the 3 points are important and more so than a top class performance which will happen when the team are fitter later in the season. There were some good performances today after a shaky start, which is expected after the last few games. Just need to build abit of momentum and the ARSENAL will be flying again. As if goal like that- rare in its particular messy awfulness- wasn’t bad enough against us the other day, now Spurs get one for them 3 minutes into a game, when we could have hoped for them to be disturbed by their loss last time out. My favorite thing from today was not Aaron’s goal (although, wow, way to be in position and way to react!) it was Aaron coaching from the sidelines while warming up. It just made my heart swell. People have been complaining for years “Arsenal have no leaders!” while ignoring the one right under their noses. Never once has he copped an attitude, even though one might understand it if he did. He’s just Aaron. All the time, no matter what. Some continental team is going to win the lottery when they sign him. Was wondering how Son still available for Spurs given heard about a player missing game last week as he had gone off to Asian cup. Seems Spurs negotiated with South Korea so he is not joining squad until their third group game. means available for 3 extra games for Spurs, including this and Utd. We needed to win today. We can be consistent here in our results. These points give us regularity for our position in the table. We are behind the top four but I want to continue close to them and in the near future we can be close. Our challenge now is to improve defensively. Today is the first time we could play with Sokratis, Koscielny and Mustafi. The injury to Mustafi meant we changed for the second half. We need to work, we need to do better in the second half of the season. He worked well in Liverpool, today he played minutes and he scored. I would expect so yes. I understand the supporters, but I need to do my work. Tactically we are thinking we need to change for more balance. We know Seri well, we need a player close to him, not let him play with the ball too easily. I think Ramsey can do that and help us with attacking moments. I need to do my work. But for me today Lacazette helped us. It’s a small injury. It’s a small problem but he didn’t feel well after the first half. He wanted to play. It’s not easy, improving our team in the transfer market, but the club is working, watching different possibilities. Maybe we can sign one or two players. We civilians should not minimize the difficulty of responding so soon after a humiliation like Saturday’s. Taking that into account, this was an impressive performance. Good win, good to see Lacca score, and Ramsey, but scary at the back. A learning point for our players, it’s the PGMOL, assume you will get absolutely nothing and play to the whistle at all times. We really seem to be operating on a different burden of proof to others that spring to mind when it comes to getting penalties. Really need to tighten up at the back, but all I have read about Emery, he will get there but via his own methods, in his own time, and not through compromise, don’t think he is the type for turning, football managers are pretty stubborn beings, and controlling over what they can influence as they have to be, and I don’t get the impression UE is a lot different . Still, despite the doubt, his substitution worked well today. 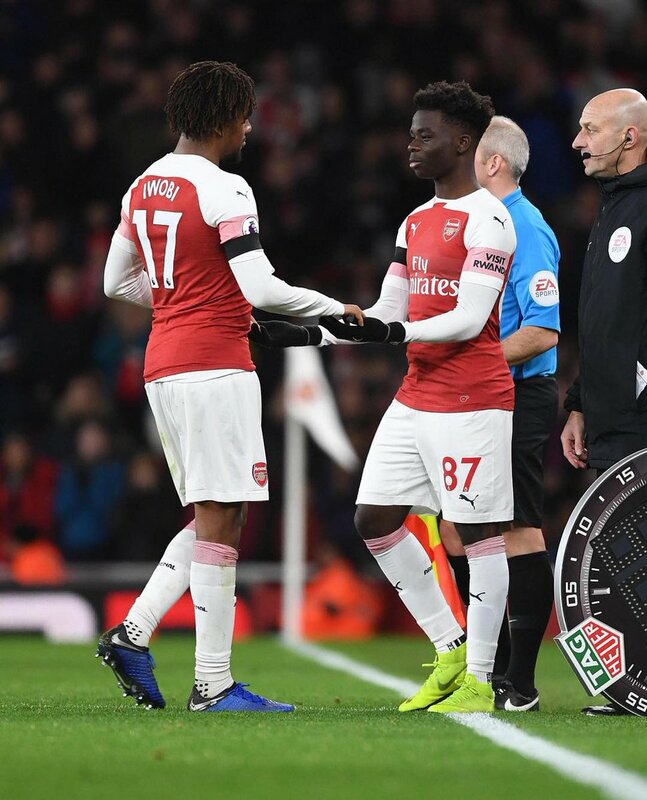 Bukayo Saka is the first Arsenal youngster to make his Premier League debut in the same season that he signed his scholarship deal since Jack Wilshere in 2008/09. The media really are bewitched by Liverpool. No mention of diving and cheating , and the way they get away with it. Seeing him waiting to coming in at the other match as if nothing has changed, I couldn’t help feeling overwhelmed by the realisation that after Theo, my last special bond (player-wise) with Arsenal may go as well.